The Prensado by Alec Bradley is a full-bodied, box pressed cigar that was developed from the wrapper inward. A special Corojo wrapper grown in Trojes, Honduras, during the latter part of 2006 was in fermentation and aging through mid 2008. Once the nuances of the wrapper were uncovered, the blending began in earnest and the Prensado was born. 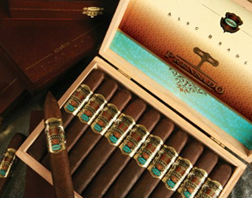 The beautifully constructed Prensado cigar offers strength, a natural sweetness, and wonderful complexity.